Along with my colleagues, Sens. Tom Begich and Bill Wielechowski, I have introduced a package of legislation to protect net neutrality in Alaska and urge Congress to reverse a recent Federal Communications Commission (FCC) order eliminating net neutrality protections. Net neutrality is the idea that the internet should be an open place for unrestricted communication and commerce. Net neutrality is so ubiquitous that most people don’t know that it is the standard for how the internet has been regulated since 1996. However, a recent FCC decision is threatening net neutrality and the internet as we know it. Last December, the FCC decided to reclassify Internet Service Providers (ISPs) as “information services” under the Federal Communications Act. Previously, ISPs were classified as “telecommunications services,” allowing them to be treated like a utility. I believe net neutrality reflects the American ideals of liberty and self-determination. Net neutrality protects our First Amendment rights while ensuring a level playing field for small businesses to compete against much larger megastores. Why is net neutrality important? Right now, you can easily visit Facebook, Google, Amazon, or any other website without obstruction. Without net neutrality protections, ISPs would be able to charge you extra on top of what you already pay to access your favorite website. You might have to pay an extra $5 to get access to social media sites like Twitter or Pinterest. If you want to shop online, then add another $10 for access to eBay or Craigslist. If you like to watch Netflix or YouTube, that will be another $15. Without net neutrality, ISPs can charge you more money for less service. Now let’s say you are a local business owner that sells outdoor gear and you do business on the internet. Currently, you can create a website to advertise and sell your product online, giving you the same access to customers as megastores like Walmart or Fred Meyers. Net neutrality creates a level playing field for your small business to attract customers and grow. With the elimination of net neutrality, ISPs may block your website arbitrarily or charge your business extra for high-speed fast lanes even though you already pay your monthly internet bill. The superstores can afford to pay extra for prioritized high-speed internet access, but a small business might not have the means to buy that access. Ending net neutrality puts small businesses at a disadvantage. Without net neutrality protections, ISPs can block online content, slow down websites that they don’t agree with, and charge for internet fast lanes. These practices hurt everyone, from consumers to corporations. That’s probably why net neutrality is supported by the ACLU, the Christian Coalition, and Microsoft. A 2017 survey done by the University of Maryland showed that net neutrality has broad public support, with 77 percent of Democrats and 71 percent of Republicans opposing the FCC decision eliminating net neutrality. Under my proposed net neutrality law, House Bill 277, services that benefit the public good would still be allowed to access prioritized internet fast lanes. Critical services like telemedicine and distance education would have access to expedited internet connections. It is incorrect to say that net neutrality protections threaten those services. In fact, retaining net neutrality would protect those vital public services from being singled out for financial exploitation by profit-seeking ISP companies. If you’re still thinking, “If net neutrality is so important, why haven’t I heard of it before now?” The truth is, net neutrality is so fundamental to how we experience the internet that we’ve all benefitted from net neutrality for years without even knowing it. Every time an ISP has tried to bypass net neutrality the FCC has been able to take them to court. Now that ISPs have the power to shape what you can access on the internet, we are on the brink of losing what we had previously taken for granted. Net neutrality matters to me because I’ve seen the technological advancements the open internet has already created. I want to ensure that the next generation of Alaskans experiences even more progress. Email, social media, and e-commerce have all changed how we connect and do business. The common thread throughout these innovations is net neutrality. Let’s make sure that the internet remains free and open for the future of innovation and let’s protect net neutrality. 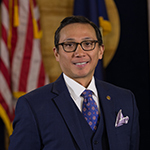 Rep. Scott Kawasaki is a Democrat from Fairbanks.